1. Mountain of Palestine, the modern Jabal al-Ṭur, on the northern edge of the plain of Jezreel. It is a dome-shaped hill with softly rounded outlines, and rises about 400 m. above the surrounding plain and 562 m. above sea-level. Standing out boldly on all sides, except in the northeast, where a low ridge connects it with the hill-country of Nazareth, it rises high above all the elevations in its vicinity and forms a landmark visible at a great distance. From the southwest it forms almost a semicircle. Its beauty and symmetry, together with its isolated position, render it, like Carmel and Hermon, important in history and tradition (Jer. xlvi. 18; Ps. lxxxix. 13 [A. V. 12]). In ancient times it formed the boundary between Zebulun, Issachar, and Naphtali (Judges iv. 6, 12, 14); and there Barak assembled his army to battle against Sisera (ib. iv. 6), while it was also the center of an ancient cult (Hos. v. 1). The Tabor mentioned in Judges viii. 18 must not be identified with this mountain, even in case the text does not require emendation (comp.Moore, "Judges," p. 228), but is rather to be localized in the vicinity of Ophrah, the home of Gideon. In like manner "the plain of Tabor" mentioned in I Sam. x. 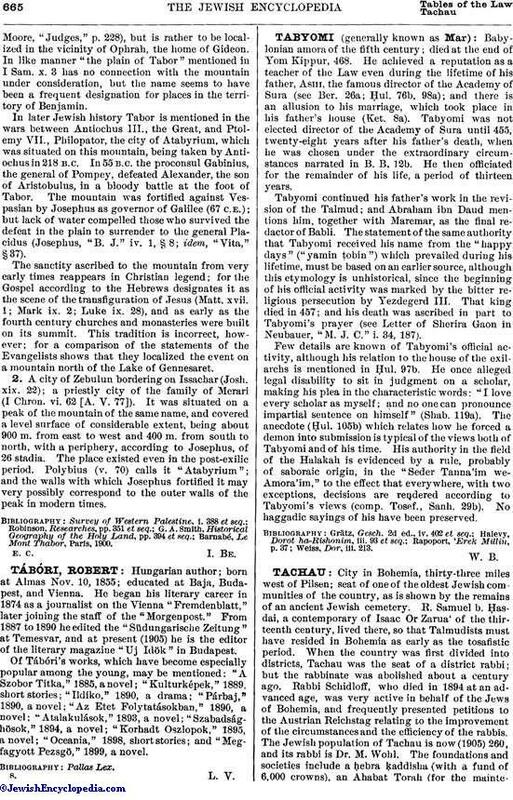 3 has no connection with the mountain under consideration, but the name seems to have been a frequent designation for places in the territory of Benjamin.In later Jewish history Tabor is mentioned in the wars between Antiochus III., the Great, and Ptolemy VII., Philopator, the city of Atabyrium, which was situated on this mountain, being taken by Antiochus in 218 B.C. In 55 B.C. the proconsul Gabinius, the general of Pompey, defeated Alexander, the son of Aristobulus, in a bloody battle at the foot of Tabor. The mountain was fortified against Vespasian by Josephus as governor of Galilee (67 C.E. ); but lack of water compelled those who survived the defeat in the plain to surrender to the general Placidus (Josephus, "B. J." iv. 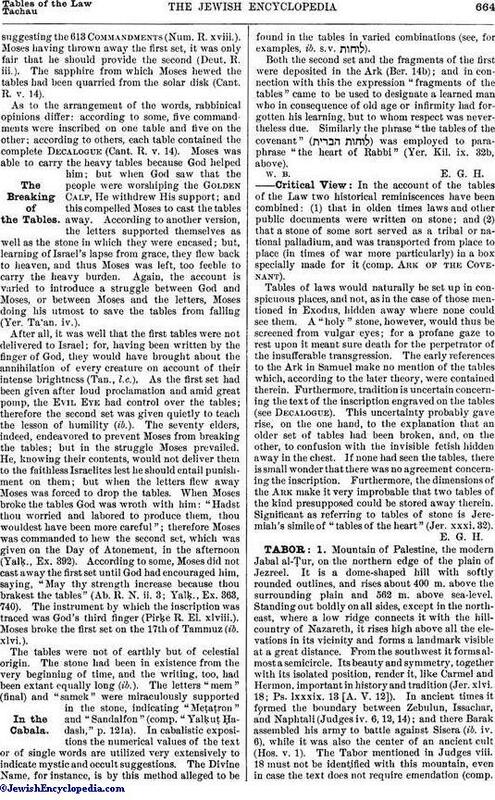 1, § 8; idem, "Vita," § 37).The sanctity ascribed to the mountain from very early times reappears in Christian legend; for the Gospel according to the Hebrews designates it as the scene of the transfiguration of Jesus (Matt. xvii. 1; Mark ix. 2; Luke ix. 28), and as early as the fourth century churches and monasteries were built on its summit. This tradition is incorrect, however; for a comparison of the statements of the Evangelists shows that they localized the event on a mountain north of the Lake of Gennesaret. 2. A city of Zebulun bordering on Issachar (Josh. xix. 22); a priestly city of the family of Merari (I Chron. vi. 62 [A. V. 77]). It was situated on a peak of the mountain of the same name, and covered a level surface of considerable extent, being about 900 m. from east to west and 400 m. from south to north, with a periphery, according to Josephus, of 26 stadia. The place existed even in the post-exilic period. Polybius (v. 70) calls it "Atabyrium"; and the walls with which Josephus fortified it may very possibly correspond to the outer walls of the peak in modern times. Barnabé, Le Mont Thabor, Paris, 1900.